Classic stills from the life of one of Britain's most cherished entertainers. 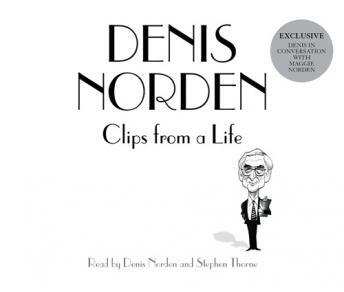 This is the extraordinary life story of comic legend Denis Norden, told in momentary snapshots by the master British comedian himself. Containing reminiscences of a career stretching back to the golden age of the radio, through the heyday of cinema and the early pioneering days of television comedy, Back Then showcases Denis Norden's creative genius at its very best. Told with Denis' hallmark flashes of brilliant humour and sharp observation, the extraordinary life of this enduring humorist is unravelled through his private recollections of the ways things used to be, back then. Denis' school-day musings, dry witticisms, and old-time sayings unearthed from days gone by, combined with remembrances of collaborations with famous figures of the day, from Eric Sykes to Bill Fraser, will sweep you back instantaneously to the magical gags, lively characters and laughter of the past. Flitting between Denis' East End childhood and early career in Variety as a cinema manager for the Hyams Brothers, to his post-war work as a scriptwriter on the groundbreaking radio shows Take It From Here and In All Directions, to the phenomenally successful television comedy Whack-O!, (all written with long-term collaborator Frank Muir), to his years as a solo writer, performer, and presenter on programmes such as the much-loved It'll Be Alright on the Night, it is easy to see how Denis' comic appeal has endured for decades, to make him one of the greatest British writers and performers to date. Brimming with Denis' unique wit and personal warmth, this is a rich and compelling mix of anecdote and autobiography from a very special entertainer.